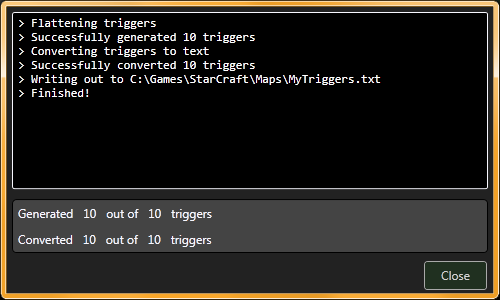 EUDGen is a program used to generate triggers that go beyond the capabilities of regular StarCraft mapmaking. It does this by taking advantage of an overflow exploit in the unit field of the Deaths condition (hence the name Extended Unit Deaths), as well as overflowing of the player field of the same condition (Extended Player Deaths). The goal of this project is to allow all mapmakers to have the opportunity to use EUDs/EPDs in their maps if they so choose, while reducing the learning curve required to do so. 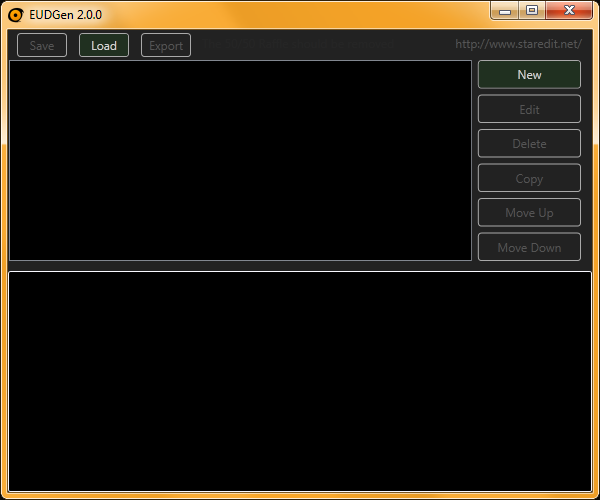 This program is the successor of EUDGen1, also known as EUD Generator. If you are more interested in the work that goes behind calculating EUDs, or just to get a better understanding on EUDs in general, please refer to the following resource: http://www.staredit.net/topic/14226/. Note that this program reads in .euddb files as well as a form of extending the native database. 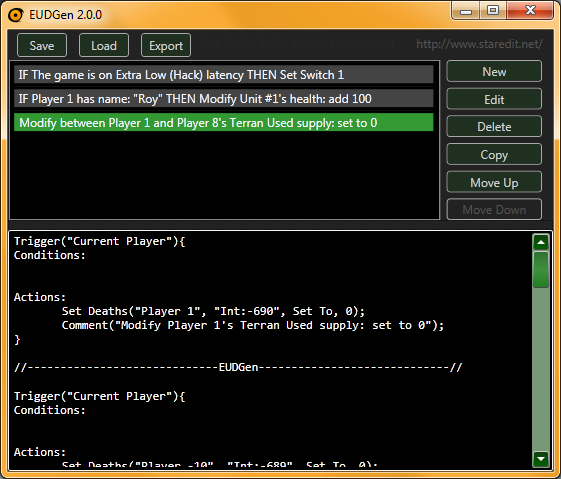 A GUI editor to create .euddb files is planned in the future. Do these work on multiplayer? Of course! The only EUDs that will not work safely on multiplayer are the conditions put under the "Local Only" tab. Note that only local conditions can cause problems in multiplayer; you can use the "Local Only" actions to your heart's content without worrying about a desynchronization in your game. See Section 5 of the EPD tutorial for more details on synchronization and how it affects multiplayer. What about Mac users? Are these safe to use with them? Macs and PCs have different ways of calculating some EUDs due to the endianness of the operating system. Included in this program's export feature is the ability to generate Mac-compliant EUDs based on the information I know regarding Mac EUDs (special thanks to jjf28 and Lanthanide for the research going into that aspect), but as I have no method to verify the outputs (and I'm fairly certain some of them are wrong), it's currently in beta stage. I would not rely on the program to generate Mac EUDs and instead do them by hand if that's an option. See this topic for more information around Mac EUDs. How come EUD Actions don't work? This may be referring to one of two things. First, EUD Actions (EUDAs) will not work without an enabler of some sort. I would recommend using FaRTy1billion's EUD Action Enabler program for this. Second, if you're copying over EUDAs to SCMDraft's text trigger editor, you'll notice that it won't compile. This is because SCMDraft's text trigger does not support EUDAs. You can still manually enter these triggers into the classic trigger editor, though, or you can use another export function (MapExport being provided graciously by FaRTy1billion) to get these actions into your map. So I heard about these things called EUPs; does this program do that stuff too? No. EUPs are a completely different method of writing to StarCraft's memory, and as such, they require a different method of calculation. If you're interested on the subject, I'll refer you to the following topics: http://www.staredit.net/topic/15356/, http://www.staredit.net/topic/15773/, http://www.staredit.net/topic/15378/. Is it going to take you another year to roll out new features or programs? Yeah, probably. Wanna fight about it? This program requires the .NET Framework 4 to run. If you're on an older machine and cannot get .NET 4 on your machine, send me a PM and I'll see if I can get it compiled on an older version of the framework. This download contains two files: the executable (EUDGen2.exe) and an external library (MapExport.dll by FaRTy1billion). While MapExport.dll is not required for the program to run, some export options will not be available if the DLL is not found. Now I'm not saying these detections are foolproof by any means; the above has just been the result of my own experimentation. They are all within a static range of memory for SC, but I can't be sure if those addresses can be assigned the detected value legitimately, so I would recommend not using these unless your map's functionality sorely depends on restricting, for example, map hacking. You can download the .euddb file here (just put it in the same directory as EUDGen2 to have it read it in): HackDetection.euddb. Unit Index range doesn't calculate properly when using index 0. Set Deaths action adds "Int:" in front of unit names. Fixed input for numeric boxes. Post has been edited 67 time(s), last time on Jun 28 2015, 1:56 am by Roy. So, the things under the To-Do list are not implemented? I'd like to have local key press events in one of my maps. I know it's been done before but this programme seems like it'd do what I need quicker than copying them down by hand. Congratulations on finally releasing it! Correct. I know a lot of people really want upgrades, but key press detection is also one of my priorities. I was gonna hold back on the release because it doesn't have many new EUDs over the old one, but I figured making you guys wait even longer would be unfair. The main utility this has over the old one is generating ranges of triggers. Why did you create EUDGEN2? What can it do that #1 didn't? For example, compare creating triggers to check all 1700 unit indexes to see that they have at least 10 HP in both programs. Additionally, I have listed features that the old program does not have. A prime example is the exporting feature, and the save/load feature. And some of the existing EUDs from the old program have additional options in this program. 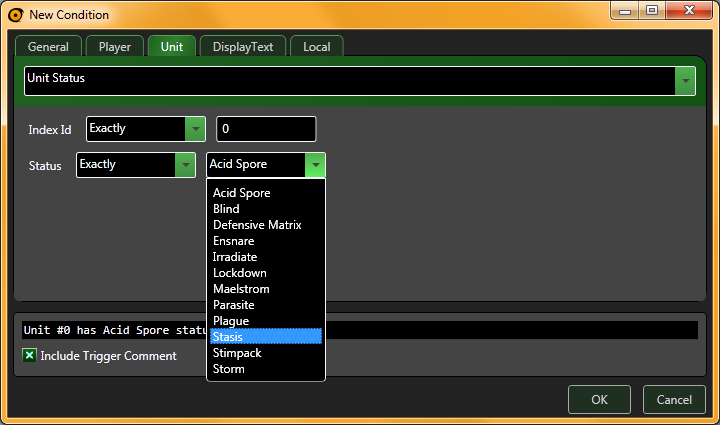 Latency, for example, now has a preset for an "Extra Low Latency," and Unit Status now includes acid spore, plague, parasite, irradiate, stasis, and even if a unit is under Psi Storm. Please review the original post for the features included in this release that you may have noticed didn't exist in its predecessor. I saw that EUDGen was headed in this direction, which is why I wanted to convert you to Oreos, so you would be able to create your macro EUD functions in an environment more suited for it. "IF Unit #between 10 and 20 has 0 health AND Unit #between 1 and 5 has 0 kills THEN Set Switch 5"
"IF ANY Unit #between 10 and 20 has 0 health AND ANY Unit #between 1 and 5 has 0 kills THEN Set Switch 5"
"IF ANY Unit #between 10 and 20 has 0 health AND ANY Unit #between 1 and 5 has 0 kills THEN Modify Unit #1's heath: add 20"
I would expect that if [any of 10-20 had 0 health] and [any of 1-5 had no kills] then unit #1 would gain health once in a loop. In reality it could happen as many as 55 times. For example, if unit #16, #17 and #18 had 0 health and units #1-3 had no kills I would gain 20 health nine times over. I don't think Oreos is designed to be abstracted into an intuitive GUI (intuitive meaning clear and easy for someone who doesn't understand how for loops or declaring variables work) that wouldn't ultimately limit its potential to something relative to what I have. 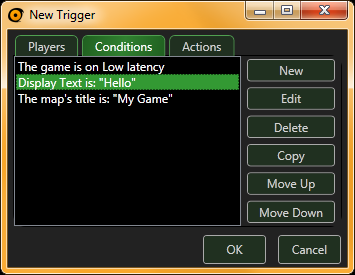 The goal of the original EUDGen was to try to keep it as familiar as possible to how the classic trigger editor makes conditions. 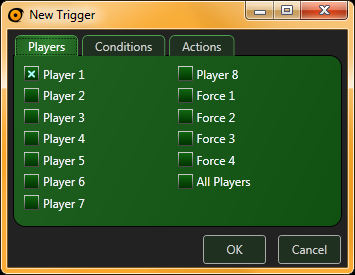 When it came to improvements, people wanted ways to generate large ranges of conditions in an environment that posed a relatively small learning curve, which is what I tried to do here, all while retaining the familiarity of the classic trigger editor. Except, it still wouldn't behave how I'd expect because the conditions combine multiplicatively. That's an interesting semantic issue you bring up. Generally, in SC when you are making triggers and you're trying to add one single condition, it doesn't apply across a set or even a range of values unless it's an actual value field (for example, you can't make a condition checking that a player brings 1 [Terran Marine - Zerg Scourge] to a location), so I used the same idea behind that for ranges that are not specifying the pure value of the condition. I found it to be consistent with how SC would handle it if you had to roll it out manually. If you wanted it to be an AND, you should be adding them separately like you would normally with other conditions. If you want it to be an OR, you should know this requires making multiple triggers manually, so the program should be expected to make multiple triggers. That was my line of thinking, at least. I can see how it's confusing because I use the same modifier "Between" for both types of operations (as an OR if it changes the address, and as a quick macro for "at least" / "at most" if it's just a value of the EUD). Perhaps I could eliminate the "Between" option for pure value fields and make the user create separate "at least" and "at most" conditions for clarity. As for actually treating ranges as ANDs instead of ORs, I find it unlikely to be the case that you'd want to AND a consecutive range of addresses in the first place, but I could make the option available. Perhaps changing "Between" to "Any Between" and adding a new modifier called "All Between" would be more intuitive? "Unit #between 10 and 20 has 0 health" generates 11 condition triggers, "Unit #between 1 and 5 has 0 kills", generates 5 triggers, but if you use them both in the same "trigger" they combine to make 55 triggers (rather than additively to be 16 triggers plus a couple more for handling). If your intent is to have this be additive and you plan on creating another trigger to figure out if both items have been tripped, how would you handle this normally? You'd create one trigger group with "Unit #between 10 and 20 has 0 health" and one with "Unit #between 1 and 5 has 0 kills," each group setting some variable, and then a final trigger checking that both variables are set (plus a cleanup trigger). EUDGen works the same way: you'd create one trigger for "Unit #between 10 and 20 has 0 health" and one with "Unit #between 1 and 5 has 0 kills," and the generator will make both groups separate since you've specified to do so. The reason it's multiplicative if you put ranges in the same trigger is because that's essentially what you're telling the program you want to do: all combinations with no fancy optimization logic. That was my reasoning, but I can understand if you disagree with me here. Again, you have to think from a regular mapmaking perspective on how this would be implemented: if you had two separate triggers checking if UnitTypeA or UnitTypeB is brought to a location and the action was to give the player 1000 minerals, you shouldn't be surprised when bringing both UnitTypeA and UnitTypeB to that location gives the player 2000 minerals. To remedy your situation described above, you could flip a switch and have a trigger checking the switch to do the health addition. I'm not trying to sound defensive, and I apologize if I've come across as such; I greatly appreciate your criticism. Anyone else getting a "fail to load file" error when trying to use the thing from the "extras" section? Oh, my mistake; I accidentally uploaded a test file I had laying around. Try downloading the euddb file again. Sorry about that. Perhaps I could eliminate the "Between" option for pure value fields and make the user create separate "at least" and "at most" conditions for clarity. Please don't. The same hypothetical potential for initial misunderstanding would still exist, at the cost of functionality and convenience. Post has been edited 1 time(s), last time on Feb 12 2013, 3:24 am by Azrael. Let me show you how to hump without making love. I would really appreciate a feature that allows me to paste/load text in TrigEdit syntax into the EUDGen. If you did this, I would create things that would blow minds. Because learning a new syntax (Oreo) isn't something I want to do when I am so fluent in TrigEdit. Well, the latest version has just been released. Those that were looking forward to key press detection will be happy to see the version log. I'm going to be working on getting upgrades and technologies worked out next week. There's also a change request on splitting the sender/receiver for chat detection that I'll try to get into the next release. If you enter no characters for padding, it won't pad the text at all. This can be problematic for scenarios where padding is necessary to properly detect the text, but it's still an available option. If you enter one character, it assumes the old functionality (at least three padding characters at the end of the message), and it functions the same as if you enter three of the same padding character. If you enter two characters, it assumes the players will always be typing two characters at the end of the message. It will use the null character as the last padding character where necessary. If you enter three characters, it will check up to what is necessary for the given message. Padding characters will be truncated off of the message where applicable, whereas the message itself is always assumed to require a full reading. If you want to have no padding characters and just rather have your message itself be truncated, enter the last two or three characters of the message as your padding. Post has been edited 3 time(s), last time on Feb 18 2013, 5:57 am by Roy. Sorry, no upgrades / technology yet. DISCLAIMER: Almost all of the information I learned about below is a direct result of Azrael's hard work and testing with the player chat system. I take no credit for his discoveries and only offer the analysis we concluded from his findings. Display text detection is not technically a global EUD: if you send a display text message to only one player, you can desync them by detecting that text and doing a global action off of it. In the same respect, player chat is not technically a global EUD: players can send and receive whispers or send to allies / a specific player in-game. 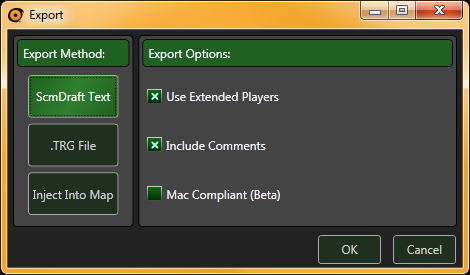 Therefore, the player chat generation provided by this program isn't necessarily "safe" in this regard. Furthermore, timing for messages sent and received by players is not synced to the game (unlike Display Text Message): messages are sent to the server, which then broadcasts it to the players as soon as it can. This has been measured (thanks to lil-Inferno and Origin for helping me and Azrael with measuring these numbers) to vary by as many as 5 hypertrigger cycles (and potentially more) to be received by all players. The reason this is an issue is because it means some triggers can fire on earlier trigger cycles for some players than for others, which would cause a desync on the end of that particular cycle. I currently do not know a remedy to this issue, and if you want to have chat detection as a mechanic in your multiplayer game, you'll have to regulate using a global timer when to execute chat actions (e.g., have a countdown timer and queue chat commands to run when the timer hits 0) and rely that your players won't attempt to send a chat command near the time that processing the actions occurs. For this reason, player chat detection is significantly less effective than I had originally realized. Chat detection works pretty well has a noticeable chance of working without desynchronizing for a single chat command in maps that do not have hyper triggers, because the chances that the trigger will execute when not all players have received the message are decreased significantly. Raw chat detection on a map with hyper triggers will desync without fail. Also, the extras section in the OP has been updated for those interested. Post has been edited 3 time(s), last time on Mar 3 2013, 12:05 am by Roy. There was a test in which the variance was 8 cycles, but it could still be even more than that. rely that your players won't attempt to send a chat command near the time that processing the actions occurs. I developed a solution to this already, in which the other players can't be desynced by someone timing their command poorly. The design has been completed, it just needs to be implemented when I have time to complete my system (which is already "functional" in the sense that it'd work if chat was synced properly). The modifications will make the system safe, so that someone couldn't choose to desync others even if they wanted to. Chat detection works pretty well in maps that do not have hyper triggers, because the chances that the trigger will execute when not all players have received the message are decreased significantly. I'd say "works pretty well" is a bit misleading. There is still a 20% chance of desync for every command used, even when the players are only a few cycles apart. In situations where they are 5+ cycles apart, which doesn't seem to be uncommon, it's going to be around 30% and higher. (sending)player "yoo" says on row between 1 and 11 "set round 15"
In game with other people, the message I set for switch 15 pops up after i type the command, but about half a second after the trigger works, i get dropped from the game. Apparantly its only me because everyone i whispered said it was only me that dropped from the game. That trigger is only working for you, because you're checking for "sending". You're the only person who is sending the message, the other players are receiving it. Since it's only happening for you, you get desynced from the other players, and drop. Theoretically, you can fix this by changing "sending" to "between sending and receiving". In reality, if you're using hyper triggers, it'll make everyone desync because chat messages are received at slightly different intervals for each player. If you're not using hyper triggers, there's a lower chance of causing desync, but it still has pretty good odds of happening.